Here’s Why You Should Choose This Wonersh Log Cabin With Attached Shed. The superb design of the ‘Wonersh’ Combination Log Cabin-Storage Shed adds a new look to the ‘norm’. The extremely useful shed section blends in perfectly with the log cabin making it an unbeatable garden building for your garden. With the single door set to one side and the double doors and windows in the log cabin section, it enables the maximum amount of use for this building as well as the maximum amount of available wall space inside. These aspects enable the greatest amount of usage to suit all your family’s requirement. If you plan to use it as a recreation room or fitness room, or as a home office, or as a ‘crash room’ for your children and their friend or as a summer room this log cabin will find all those needs. Give some thought to how much use you can get out of this cabin – you will be amazed! And no wasted space in your garden. The Swedes know the secret of the Nordic timber and is used extensively in their country. The slow-growing nature of this wood makes it ideal for log cabins – being both strong and stable. The ‘Wonersh’ cabin benefits from this great natural material and which will enable a long life for your new log cabin with a shed attached. The design of these ‘Wonersh’ garden cabins has a stylish and very attractive Georgian effect or contemporary design. I’m sure we can help as we always remember it’s your cabin and should reflect your requirements. Solidly constructed from Nordic timber these ‘Wonersh’ Log Cabins are made the correct way and with the right materials. Other log cabins companies take a different view and try to made DOWN to a price. This is never a good long term policy. You may save a few hundred pounds but ultimately you want your new log cabin to last and, as important, to look good for the foreseeable future. By the use of cheap chipboard, OSB board or other sheet materials this can compromise your new building. Beside the carcass of the building the quality of material used should flow through into all the fittings as well. Double glazed windows with proper glass (NOT plastic) should be standard. All timber should be properly kiln dried and (very importantly) from sustainable sources. This superb ‘Wonersh’ garden log cabin can optionally be assembled for you by a third party saving you time and effort. As they do this on a regular basis your new cabin will be up very quickly and importantly correctly. Having said that it’s possible for you to assemble these buildings as everything is done to make it straightforward. The ‘Wonersh’ log cabins are initially assembled at the factory before being flat pack and shipped to you. All parts are bar coded for ease of access and by following the log cabin guideline can be assembled efficiently. The secret is to take your time and work through each step one at a time. Want a challenge then there you go! It’s easy to find an array of log cabins on the ‘web’ however it’s hard to know what the quality is like. This is why it’s important to view at least some of these cabins made by the manufacturer. We have a log cabins UK display site where you can see an example of other log cabins from this range so you can examine the build quality of these buildings. Hopefully, in the near future we will have more for you to see – just to give us a call for an update. This site is situated near Woking in Surrey, about 5 miles for junction 10 on the M25, so reasonable accessible. So don’t take a chance – always deal with a company which has its products available for viewing. You won’t regret it! You can also be sure that 1st Choice, a family business, started in 1979 understands the requirement to make log buildings to a standard and not DOWN to a price. Our Ethos is to ensure quality reigns over cheapness and to date has been the right policy. Size: Two sizes to suit you. 3.9m x 2.4m (13ft x 8ft nominal) and 4.85m x 3m (16ft x 10ft nominal). Apex, gable or ‘A’ Shaped roofed Log Cabin Style. Note this is the external size of the body of the cabin. The lugs extend 100mm on each corner making the overall size (as most other companies quote) 200m larger. We mention this so you know you are comparing ‘eggs with eggs’. Approximate clear internal size will be approx 3.8m x 2.3m or 4.75m x 2.9m. Please check with us if internal size is crucial. 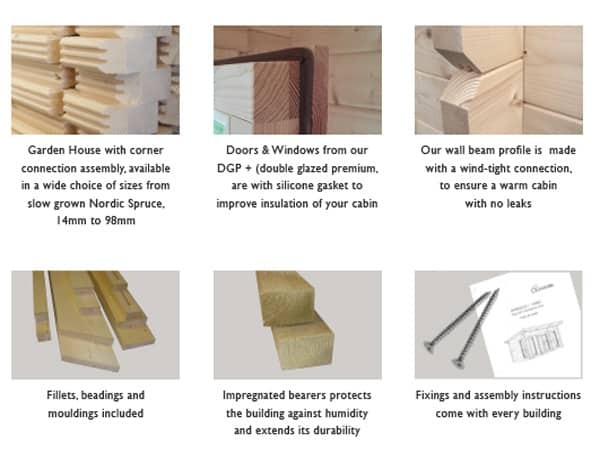 Cladding: The highest grade of Spruce is specified which is only sourced from the coldest parts of the Northern Nordic region to ensure the maximum stability and longevity of the timber. Naturally this costs significantly more but we will not cut costs in this area and risk the quality of your building in search of a quick profit. Doors: Joinery quality double glazed double doors 1494mm wide x 1850mm high (58¾in x 72½in) – approx sizes. Easy adjust hinges complete with gasket seals, fitted silver finish door handles, cylinder lock and two unique keys. Low doors sills giving you easier access into your log cabin. Supplied untreated. Beware of doors with single glazing or excessively high door sills. Partition: Internal partition included as standard giving you two distinct areas within this log cabin combo building. Untreated. Kiln dried timber from sustainable sources. Side Door: Joinery quality single door 835mm wide x 1850mm high (32¾in x 72½in) – approx sizes. Easy adjust hinges complete with gasket seals, recessed door latches, highly secure Euro Cylinder barrel Type mortice lock, fitted gold finish door handles and three unique keys. Supplied untreated. Beware of doors with single glazing and no multi-point locking system. This enables easy access into storage section. Windows: Classic or Georgian style joinery quality inward opening window included as standard. Size of window is 56cm wide x 178cm high (22in x 70in). Complete with easy adjust hinges, silicon gasket seals and delightful silver finish window handles. Supplied untreated as standard. Double glazed as standard NOT single glazed. 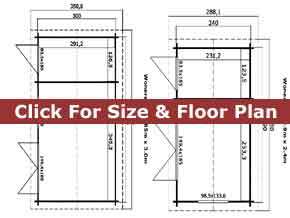 Lower Walls: Height: 211cm (80in) – on all Wonersh multi room log cabins for sale. Ridge Height: Height. 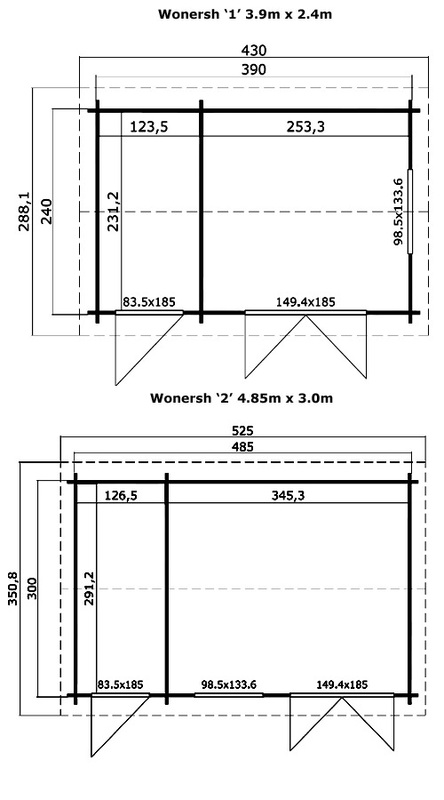 2571mm – on all Wonersh multi room log cabins. 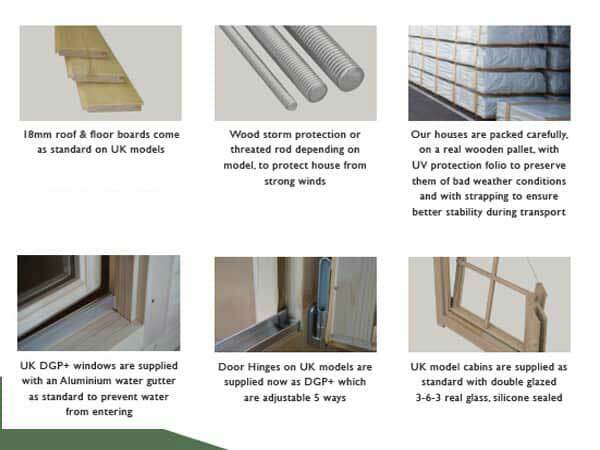 Storm Protection: Provided as standard are either ‘Wood Storm Protectors’ or threaded rods. This helps to ensure that the wall planks on your log cabin will remain tight together depending on the weather. Erection: Log cabins are supplied in kit form for self assembly. Option for assembly through a third party if required. If being built you would require a concrete base or solid and level paving slab base. Optionally, we have an option for building a base for you. These log cabins are assembled by interlocking the panels for ease of taking it down again if you decide to move. Insulation: Optional insulation to the roof supply only and would consist of Reinforced Thermo Reflective and Vapour Control Layer (special silver quilted membrane), Thermo Reflective Aluminium Tape (used to seal all joints in the roof insulation and over the floor joists), Insulation Board – a Celotex Foil 2 sides rigid insulation board – 25mm thick measuring 2400 x 1200mm. 11mm thick solid sheet boarding (OSB) measuring 2440 x 1220mm or 2400 x 1200mm and all screws and fixings. This Wonersh Log Cabin shed Combination is an inspiration with the main building and a separate storage area combined making for a seamless and gorgeous appearance. You also have a choice of classic or the delightful Georgian windows. These Nordic wood cabins are under 2.5m tall for planning and fully double glazed for comfort. Take a look at examples of wood log cabins before spending your ‘hard earned’ money so you can be sure of the quality of them. Our log wood cabin display are is close to the M25 in Surrey so take a trip down to judge our range of wood cabins for yourself. Don’t take chances with your money.